Bringing robotics into the surgical process has been a considerable motivation for researchers in recent years. For instance, at the back end of last year I wrote about a new robotic surgeon that had been developed by a team from the John A. Paulson School of Engineering and Applied Science and the Wyss Institute for Biologically Inspired Engineering. The team were trying to develop tactile robots that could adequately perform the kind of fiddly work so often required in surgery. Or you’ve got startups like Virtual Incision, who are attempting to take surgery inside the body. They have trialed what is believed to be the first miniature robotic device for surgery to help remove cancerous growths in a patient in Paraguay. The device is incredible because rather than operating on the patient from the outside, the robots are actually doing their work from inside the patient. They are fed into the body via a small cut in the abdomen and then tackles its work using many of the tools doctors are already familiar with. “To the best of our knowledge, this is the first time an active miniaturized robot has performed complex surgical tasks with the robot inside a living human, which is a significant milestone in robotics and in surgery,” the company say. Or you’ve got the Smart Tissue Autonomous Robot (STAR) that’s been developed by a team in Washington D.C. The team use 3D imaging and impressive force sensing capabilities to stitch wounds to a submillimeter level of precision. It was created using experienced surgeons as teachers, with the eventual aim of surpassing the capabilities of its mentors. The latest in this line of so called soft bots is from Harvard and goes by the name Octobot. Their project highlights both the progress made in robotics and also in the manufacture of the robots. The device is untethered, and thus completely autonomous. It requires no electrical power, nor any form of control system to operate. Instead, the power comes via chemical reactions between hydrogen peroxide and platinum. This forms a gas that flows through the machine to provide it with power. Now, it should be said that the device is unlikely to be put into operation for a while yet, not least because the movement of its arms are limited to simple up/down movements. It is, however, a nice progression in the field, and a sign of the progress being made. 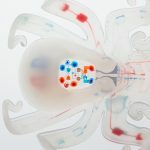 The design of the robot is unashamedly borrowed from that of an Octopus, with the researchers hoping to borrow from the strength and range of movements of the creature, all achieved without a skeleton. This new wave of more flexible, dexterous robots opens up a range of new possibilities in surgical environments as they offer a much richer range of movement and flexibility. We’ve already seen robotic surgery take place, but this was typically tethered to a power source and operated by human surgeons, so the Octobot is a nice progression on both counts. Whilst it’s still at a very early stage therefore, it’s an important step forward nonetheless. Check out the video below to see Octobot in action.